Does Sports Massage After a Workout Have Any Benefit? 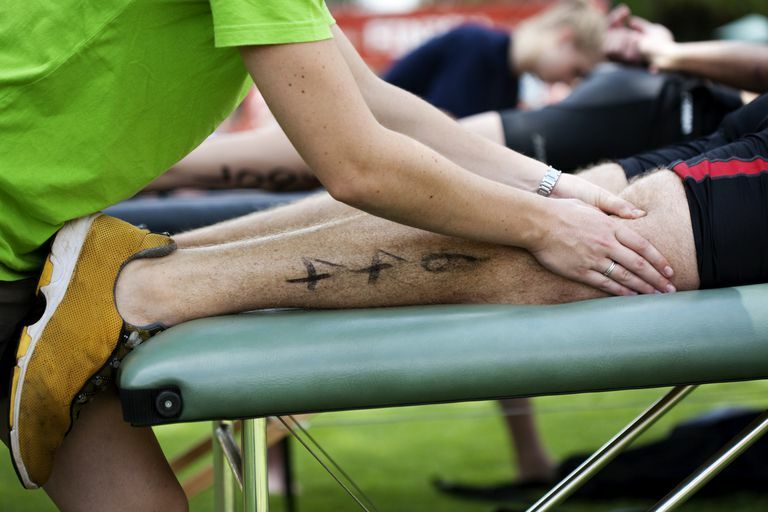 At the finish line of every marathon or half marathon, you see the sports massage tent set up and racers lined up for a treatment. But does sports massage after an intense exercise workout speed muscle recovery? Does it reduce delayed onset muscle soreness (DOMS)? While athletes of every kind use sports massage, the hard research into whether and how it works has been sparse. If you wonder whether to treat yourself to a massage after a race or hard workout, the best evidence is that it may reduce your soreness. Reviews of clinical trials concluded that there is some evidence that sports massage reduces delayed onset muscle soreness. Getting a leg massage after a race might mean fewer aches in the following days. One review found evidence that massage worked while other commonly used tactics of icing, stretching and doing low-intensity exercise did not have any effect. They couldn't determine what the right timing is to get the massage or if one kind of massage is best. Does Massage Help Recovery for Performance? The jury is still out as to whether sports massage will help your muscles recover faster for performance. The evidence from case studies versus randomized controlled trials shows either no effect or some effect in facilitating recovery. A 2008 study by Ohio State University researchers found evidence that Swedish massage improved the time it took for the muscle to recover and the massaged muscles had less damage and less evidence of swelling and inflammation. The four-day study was performed on rabbits rather than humans. They were sedated and their muscles put through simulated exercise. The test group of rabbits then received simulated massage while a control group didn't get massage. The massage imitated Swedish massage techniques, which are the most popular for sports massage with long strokes, kneading, friction, and joint movement. After the exercise and massage, the researchers tested the muscle tissues of all of the animals. The specific muscle tested was the anterior tibialis, which in humans is the shin muscle that often complains of shin splint pain when you begin or change your walking program. While the rabbits showed some effects of improved muscle recovery from massage, a previous study of human cyclists published in the April 2004 issue of the British Journal of Sports Medicine concluded that there was no measurable effect in the ability of their leg muscles to perform after either of leg massage or resting recovery. But the cyclists reported less fatigue after massage. Walkers training for a half marathon or marathon may benefit from sports massage after their long workouts if only to reduce muscle soreness. You can find a certified massage therapist in your area. A cheaper alternative is to train your walking partner or spouse to use simple Swedish massage techniques. Using a foam roller to perform self-massage might also be a less expensive way to get the benefits of massage. Butterfield TA, Zhao Y, Agarwal S, Haq F, Best TM. "Cyclic compressive loading facilitates recovery after eccentric exercise." Med Sci Sports Exerc. 2008 Jul;40(7):1289-96. A Robertson, J M Watt, S D R Galloway. "Effects of leg massage on recovery from high-intensity cycling exercise." Br J Sports Med 2004;38:173-176. Best TM, Hunter R, Wilcox A, Haq F. "Effectiveness of Sports Massage for Recovery of Skeletal Muscle From Strenuous Exercise." Clin J Sport Med. 2008 Sep;18(5):446-60. doi: 10.1097/JSM.0b013e31818837a1. Rui Torresa, Fernando Ribeiroa, José Alberto Duartec, Jan M.H. Cabrid. "Evidence of the physiotherapeutic interventions used currently after exercise-induced muscle damage: Systematic review and meta-analysis." Physical Therapy in Sport Volume 13, Issue 2, May 2012, Pages 101–114.